Sonic Mania is a 2D platformer 26 years in the making. No, it’s not because it took that long to develop the game. After all, its retro style is meant to loosely imitate hardware from the Sega Saturn era and its story occurs after a game from 1994. What I mean is that it took all these years for Sonic Team to shape the lives and interests of Sonic Mania’s eventual developers. Only with years of pent-up passion could this game exist. Related reading: All our Sonic reviews (and we've done a lot). Before diving into why Sonic Mania is a triumph, though, I’d like to point out that simply releasing a 2D Sonic game has never been a guarantee of AAA quality. Some of the problematic 2D outings date back to 1992 with Aspect’s version of Sonic 2 for the Game Gear. Sanzaru Games’ Sonic Boom titles tried to distinguish themselves by trading high speeds for plodding pseudo-puzzles that lacked both challenge and imagination. The Dimps-developed Sonic Advance series presented great moments of classic gameplay with subtle improvements, but even these fell below Sonic Team’s efforts of the early nineties due to design choices that contradicted Sonic’s skill set. I’m a staunch believer that Sonic can work in 2D and 3D formats, but various problems stemming from the character’s unique gameplay have proven to be a roadblock. One is that companies have bottom lines and thus need to rush these games out as soon as possible. Take a look at the development history of the series’ most reviled titles, Sonic Boom and Sonic the Hedgehog (2006), if you don’t believe me. The blue blur’s status as Sega’s mascot understandably demands frequent releases, but churning out titles faster than the speed of sound is a setup for flawed gems at best and indefensible disasters at worst. Panned gimmicks like Sonic Unleashed’s werehog reek of developers grasping at straws to produce “content” at a hasty rate to fill quotas. 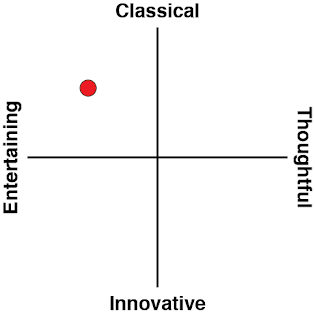 Obviously there are underlying creative issues at play as well, but you get the picture. From its conception, then, Sonic Mania has represented one of Sega’s greatest victories in years. This is a game that began life as an independently produced prototype; a work of passion, not obligation. Headed by Australia’s own Christian Whitehead, we’re talking about a prodigy who was practically raised to produce this game. 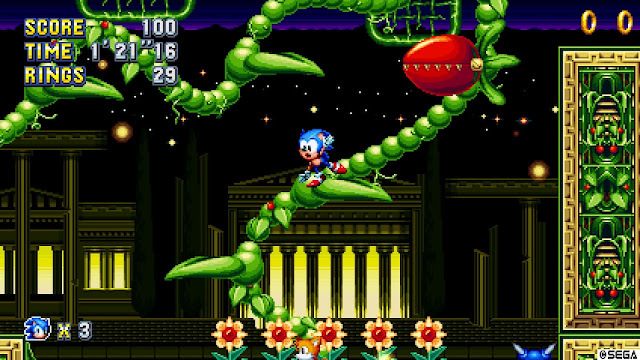 After over a decade of developing Sonic fan games (including his own revolutionary engines), his efforts bore implausible fruit when Sega green lit 2011’s mobile port of Sonic CD. That was an opportunity that he knocked so far out of the park the ball disintegrated; it remains the best classic port I’ve played on a mobile platform. Backed by similarly talented individuals that have gone unnoticed in the public eye, Sonic Mania’s name reflects the fact that it is a game made by the fans for the fans. How did this team succeed where others have failed? To invoke a clichéd comparison, Mario games have always been wildly successful at providing tight, well-designed levels. Those games work because the plumber’s running and jumping mechanics are simple and calculated down to a science. Levels can be plotted out on grid paper and play out relatively predictably (sans secrets and possibly powerups), so you can refine them and cut out what doesn’t work. A great Mario level is like a full course dinner assembled by a master chef, playing out a linear sequence but still managing to surprise you with individual bits of depth, flavour, and presentation. If Mario is a meal, though, Sonic is a trip to a theme park. His levels are not tight and controlled but massive, sprawling entities exploding with variables and alternate pathways that dynamically respond to his abilities. Sonic runs and jumps, but his movements and speed vary wildly on the scenario. Two players trying a level for the first time will not do so in the exact same way thanks to differences in reaction speed and their own sense of exploration. The goal of this comparison is not to imply that a good steak is better than a rollercoaster but that they’re wildly dissimilar experiences. Having said that, a disastrous theme park is a lot more striking than burnt steak. 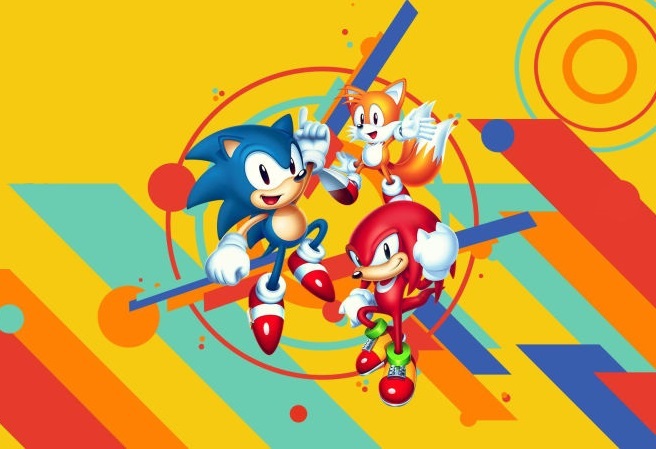 With Sonic Mania, I believe Christian Whitehead and friends tapped into what makes Sonic work on a fundamental level. Sonic’s continued momentum acts as a reward. Players achieve this through quick reflexes and are rarely punished for being unable to predict the future. Memorisation is a definite boon, but not required by any means (especially now thanks to Sonic’s new drop dash ability that helps maintain top speed). Obstacles are daunting, but players are given time to react and there are minimal leaps of faith. 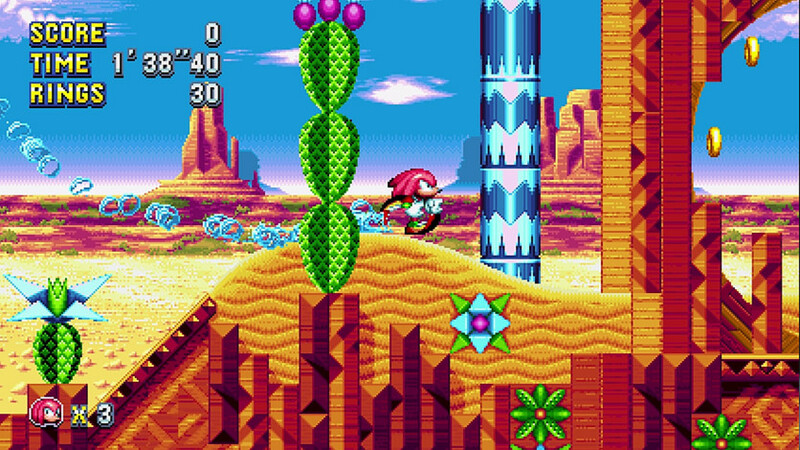 Playing as the fastest thing alive is good fun, but switch to Knuckles or Tails and the exploration elements shine. Stages can be radically different depending on what character you choose. Levels achieve synergy between vertical and horizontal space, resulting in stages that are vast and unique but grounded enough to keep from being too chaotic. The level design gives rings a deeper purpose than being collectible; they guide the player towards points of interest. You’d be surprised how many Sonic games ignore that or do so poorly. Players are then remunerated for discovery with an array of goodies that protect them from environmental hazards. Besides being a reward, speed is used for flashy transitions from area to area. These sections give the player a chance to rest with pseudo-cutscenes that last no longer than a few seconds so as to be unobtrusive. They’re not about robbing control from under your thumb to pad out levels, but enhancing the pacing and fluidity. The game also leverages collectibles to make actions more meaningful, yet not at the price of slowing things down. Some have complained that it barely matters whether Sonic has one ring or 300, but that couldn’t be further from the truth here. Because a game over means you need to restart a zone from scratch, the extra lives granted by collecting 100 rings are immediately evident. Nabbing of them 25 grants you access to an optional special stage, the famous Blue Sphere from Sonic 3 & Knuckles. Complete one of these stages and you’ll unlock countless new modes and even moves for Sonic himself. It’s disappointing that some of these options can’t be used outside “no save mode”, but at least they’re there. You’ll find your route subconsciously shaped by the prospect of nabbing more rings and getting to play a little more of the addictive Blue Sphere. By offering something that tangibly links every playthrough together, Mania enhances the classics. But just speaking about Sonic Mania on a mechanical level does it a disservice. So much of Sonic’s appeal is the personality exhibited by characters, areas, and attention to detail. Instead of Sonic being launched by a spring to reach a higher platform, an early stage leaves it to the rather obscure Sega Sonic Popcorn Shop. Such stylish aesthetics change menial tasks into exciting ones, even with common enemies. Knock away one of an Orbinaut’s projectiles and it’ll shoot a gaze of legitimate disappointment in your direction. When Sonic completes a zone, the next level doesn’t automatically begin. No, you get a transition scene that tells the story of where Sonic is headed next and why. It’s so very charming because it’s told without a single line of dialogue, just plain old sprites. The attention to detail in Sonic Mania really is astounding. Every stage is teeming with little love letters to obscure and forgotten Sonic games like Sonic the Fighters. So many little touches like being able to alter the future of Stardust Speedway in a throwback to Sonic CD kept me on the edge of my seat. The retro cheat codes are in full swing with features like debug mode allowing you to break the game for your own amusement. Heck, there are even hidden references to meme culture and this game’s own announcement trailer. The best bits are ones that combine existing pieces of Sonic history into something new entirely. 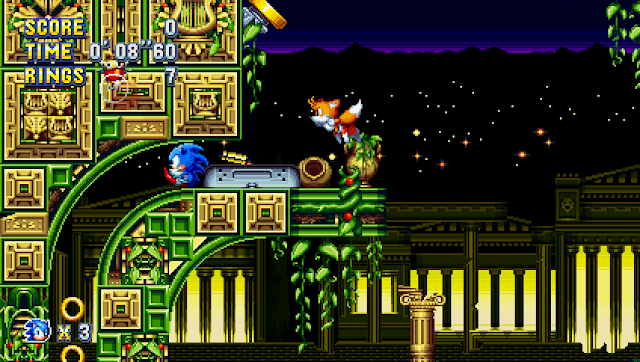 The new bonus stage is possibly the best of any Sonic game ever, melding elements of Sonic CD with Sonic 2 and even Sonic R. For all its nods to classic fans (and believe me, there are dozens upon dozens) Mania is still genuinely fresh. Yes, Sonic Mania is a nostalgia overload in the best way possible. With this game, Christian Whitehead has milked the format of the retro Sonic games for all they’re worth. 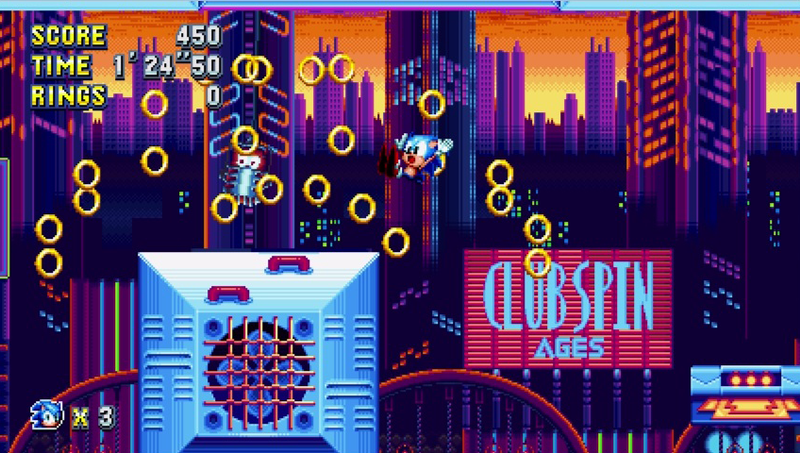 Despite the first zone being the classic but weary Green Hill Zone, Sonic Mania surprised me instantly. My fire shield power-up burnt a log out of existence, a mechanic that certainly was not present in Sonic 1. Sonic 2’s Chemical Plant Zone has the feel of the original but throws in new mechanics like water-altering syringes that feel completely at home. 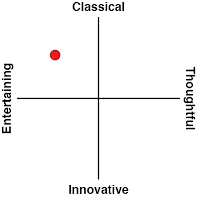 But more importantly, the levels picked are diverse and representative of the designed philosophies applied to those games. We see the labyrinthine designs of Sonic CD show up in Stardust Speedway, for instance. 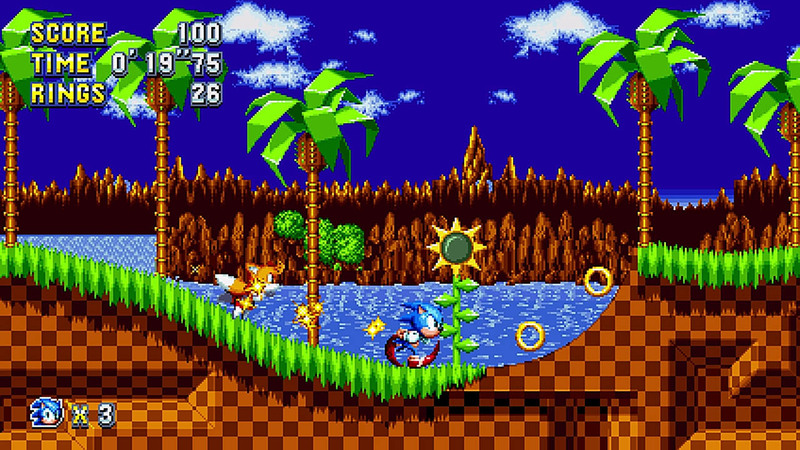 I love the original Sonic stages to death, but if given the choice, I would probably crawl into the past and insert Sonic Mania’s renditions of them. This is not a "best of" but a bonafide sequel. Even more shockingly, the best levels might just be the brand new ones such as Mirage Saloon Zone. That one takes the idea of the Wild West and breathes life into it with distinctly Sonic tropes (not to mention incredible cameos). Every level is so extraordinarily thematic, filled with enemies appropriate to the zone. That’s something that games like Sonic the Hedgehog 4 missed the boat on at times. Tons of quirky, level-specific mechanics make each zone pop, such as one with a Wario Land-style of using the world's obstacles to alter Sonic. Every level here has its own set of surprises that took me aback from start to finish. Where the game improves on the classics most blatantly is the boss fights. Whereas my earlier statement about replacing the old levels with these ones might be controversial, I think most will agree that these bouts are intense like never before. Old Sonic bosses were typically more about exploiting the game's physics engine than traditional platformers, but here they acknowledge that novelty while also demanding players figure out strategies to win. Expectations are constantly toyed with, such as a role reversal where Eggman is subjected to the dreaded water physics while Sonic pilots a mech instead. These highly inventive bouts are not something to dread but to anticipate as much as the levels themselves. Another element that will keep you anxious for the next level is the soundtrack, which, as a longtime Sonic fan, blew me away in awe. These games are typically praised for their soundtracks even in the worst of games, but Mania is on another level. Like Sonic 3 & Knuckles, every single level has its own theme with each pair of acts sharing common melodies. At the risk of gushing, Tee Lopes’ remixes and original tunes make me feel like I’m transported to another plane of existence. There’s this inescapable rhetoric that latches onto the mere whisper of the name “Sonic the hedgehog”, claiming the blue blur hasn’t had a great game in decades. While I disagree, Sonic Mania is a liberating experience that needs no asterisks to qualify it. Sonic sequels have so often been rushed or subjected to gimmicks that compromise what works, but Mania finally stops to acknowledge past successes, adds logical improvements, and enhances it all tenfold with personality. It even proves that Sonic can be more nuanced than the cursed phrase “gotta go fast” implies.